This year I had the pleasure of interviewing the two inspirational mamas behind one of my favorite kids clothing lines the Ice Cream Castles, Veronique Barnes and Wells Nathan! This is a line that I personally dress my boys in on a weekly basis, if not daily! They have some of the cutest prints out there for your littles, and did I mention that they are all hand drawn! I immediately felt a connection with the brand, and with its creators! These two women are bringing the funk back into kids clothing with inspiration from music and their own littles. I loved every moment shared with Veronique and Wells and our children. 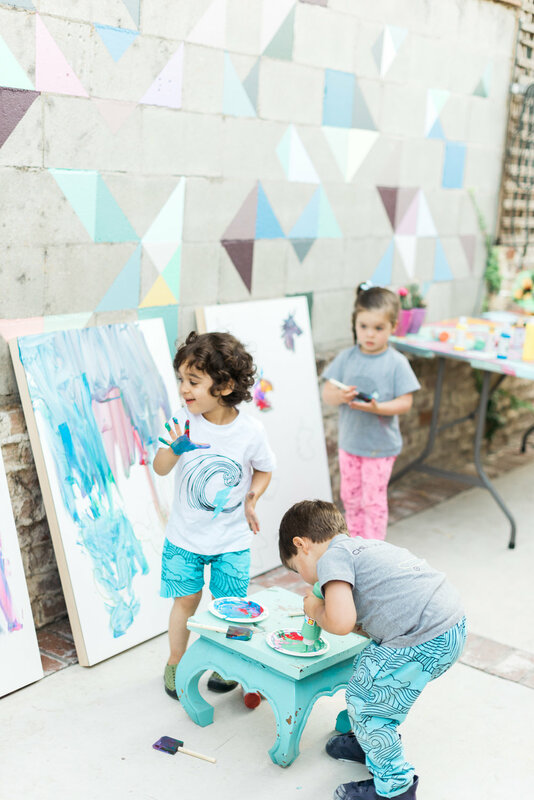 Read on to find out all the nitty gritty on the Ice Cream Castles and how they came to be one of the raddest kids clothing brands today! 1. What was the inspiration/ moment that led you to start The Ice Cream Castles children's clothing brand? How did you come up with the name? Wells: Motherhood inspired us to start Ice Cream Castles. We wanted to create a line we would want for our own children. A line that was comfortable but also had cool factor . 2. How old is your brand? V: The brand is very new. It is only a year and a half old. We have come a long way in such short time. 3. What ages do your clothing lines cater to? V: Our Brand Caters from newborn children to the age of 10. W: Our sizes start at 0-3 month and go up to 10 years. 4. How did you two meet? How much longer after meeting did you decide to work together? V: Wells and I worked together at a boutique called Dari in studio city years ago. We Immediately became the best of friends and have been very close ever since. We always wanted to work together on something but we were invested in our own lines, Wells had a womans line and I a Jewelry line so it wasn't until years later after our children that it came together and made perfect sense. W: Veronique and I have known each other for a very long time. We joke and say we met in our other life. Our life before we started our families. We met while I was in design school at F.I.D.M. and was working part time at a boutique called Dari. We worked there for years together and forged a dear friendship. 5. What were the steps you took taking your concept and turning it into a brand? V: We originally wanted to make vintage tees and clothes for kids. But we realized there is a lot of that already with brands like junk food etc. so we decided to come up with a story that was imaginary and the clothing would come from those imaginary places. W: We had a lot of meetings at our local bakery where we brainstormed the concept and line direction. One thousand croissants later we were ready to launch. 6. Did your original concept for the brand evolve by the time you started production on the first line, and how? V: The Concept of Ice Cream Castles is a story of children that travel to all these make believe imaginary places, and they go on these wanderlust adventures and see music and Wells and I found there clothing in a treasure chest in an Ice Cream Castle. So each collection the children travel to a different place and we design based on the story that they travel to.. It has gotten bigger and more solidified since we started but we have stayed pretty true to the story of our brand and always make sure we are telling that story through each collection. W: Originally we wanted to just develop vintage inspired t shirts only. But after about the third meeting we realized we wanted to create a full collection with vintage inspired print driven separates. 7. What was the concept for the premier line you produced? V: The first season the story was that the children traveled to a place called Album Island that was one of my favorites. W: The first collection centered around island adventures. It was very nautical with a whimsical color palette and great graphics. It was the perfect collection to launch with. 8. How do you feel The Ice Cream Castles differentiates from other children’s clothing brands? V: I think its concept is more story based and Although there are a lot of repeat print brands for children I think the story we tell with each season is what sets us apart from the rest of the brands out there. W: Ice Cream Castles is unique because all of our art is hand drawn. And each collection tells a unique story. 9. What other creative outlets do you enjoy/practice? V: My first love is acting so I still pursue that, I also love crafting, and writing. To me art is life so i try to find creativity in all that I do. I also Love hot yoga. W: I love fashion design, wardrobe styling, and interior design. 10. What deign or collection has been your best seller? V: The Desert Raddness Collection has been the most successful our unicorn print and the cactus skate board too people loved. 11. What is your favorite piece from the Dessert Radness collection? 12. How did you find the inspiration for your latest collection, “Dessert Raddness” ? Do you find you take different steps to producing each collection, or do you stay on a set path? V: I go to coaachella every year. and I was there when we were talking about the next place that the children would travel too. I thought what would a childs trip to the desert look like :) and it all fell into place. W: Because every season is about a different journey, the particular journey is what inspires the collection. Dessert redness was about a journey to a magical dessert with the chillest skate shops and dreamiest unicorn cones. 13. How have your children influenced/ inspired your designs? V: Yes, Jude, Juliet, and Jagger are the og ice cream castles crew. They model for every line and it has become a really cool world we have all created to each other. W: My son inspires my designs because I pay attention to the silhouettes and fabrics he gravitates to. Our children are like our own Research and Development team. 14. How has motherhood inspired you? V: Mother hood has made me feel like anything is possible. I felt as if I could have two babies at one time i could do anything. I think mothers are the strongest and its all about channeling that strength into your creativity , I truly believe that is where the gift lies. W: Motherhood has inspired me to reach my full potential for myself, for my son, and our family. 15. Do your husbands contribute to designing the collections? V: We are both married to DJ, Producers so i think we are both very influenced by music and pop culture. My husband is a great person to bounce ideas off of. Especially with the boy prints. W: My husband is a good sounding board. I value his opinion, he always offers a different perspective on things. 16. What were you doing before you started the brand? V: I am an actress & was a jewelry designer. W: Before Ice Cream Castles I had a women's contemporary line for years. And shortly before I had my son I did wardrobe styling. 17. What are other brands that you love to shop for your kids? V: I love Pre Fresh, Nununu , Stella Kids , Vans , Mini Melissa shoes also You can always find gems at target and of course Gap Kids. W: In my son's closet there are a mix of cool pieces from Ice Cream Castles, Zara, Mini Rodini, Little Moon Society, Bobo Choses, Stella Mc Cartney and H & M.
18. What kind of music do you play for or around your kids? V: What kind of music do you play for or around your kids? We are always playing music. We play a lot of what we listen to which is Pop, electronic Music and hip hop but we also love to listen to the classics. I love all music but Juliet loves Pop and Dance music the most because that is what her papa makes. Jagger loves Kendrick Lamar, Justin Bieber and Old Skool Hip hop. He says after they say sit down at pre school “ Be Humble” to the teacher its really funny. W: My husband is a dj so he plays the most well curated mix of music for our son. 19. What are your favorite places to go with your kids in L.A.? V: The ocean, The Park, The Mall. I love taking them to museums too. W: We are in a big museum phase right now. 20. How do you make time for yourselves to relax while running a successful children’s clothing brand and raising kids? Do you have set date nights with your husbands? V: I don't rest that often.. haha Its pretty nonstop for us all the time. My date nights usually look like ordering food in and watching a great movie or show. I really enjoy the time my husband and I have alone tho like when we get to go to concerts or even out to dinner.. its always such a treat. I figure that I will have plenty of time later in life to be alone with him so we try to be with the family as much as we can. We miss the kids too much anyway when we are away from them . W: My favorite way to relax is down time at home with my family. Second favorite are spa days. 21. What would you say is avant-garde about The Ice Cream Castles brand? V: I think Avant -Garde is the perfect description for our line. It is very different in the sense that it is based on story telling. I love that we create all our look book sets like movie sets and really try to bring these imaginary worlds to life. I feel the world needs more things magical especially with all the darkness and hate in the world. We are very much about creating art with our line. W: Ice Cream Castles is avant garde in its approach to story telling with clothes. 22. What is your avant-garde presence and contribution to the world we live in today? V: I think the more light you can bring to anything you create the more inspired people will be. Our message is love and light and there is nothing more joyful than all things child like. I think the idea that anything is possible and that we can have these children travel to any kind of imaginary place is what I am the most inspired by. In todays world i want to bring more love and imagination to the darkness of todays times. That and color. The world needs more color !!!!!! W: Our avant-garde contribution to the world is being true to our selves creatively and designing clothes for our future leaders.